It is not easy to find hotels in El Born district: chains have rather preferred other areas in the center to settle down. 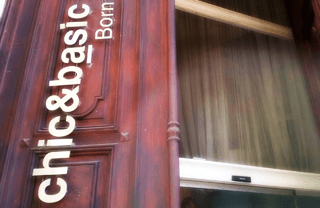 The choices aren’t many, but you’ll still find a place to stay in El Born. After the restorations carried on for the 1992 Olympics, El Born became the place to be: young clothes designers opened their ateliers here, then followed the chefs with their cozy restaurants and tapas bars. And even if some international casual brands have opened stores there, most shops are still unique and local. 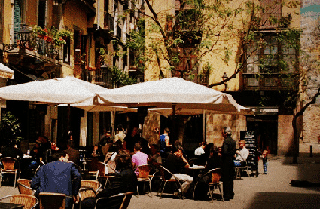 El Born is, for many people, the Barcelona equivalent to the SOHO of NYC. 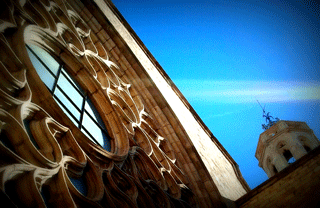 There are plenty of things to do if you are staying in one of the hotels in El Born district. Is some time ago somebody had told me that there would be a luxury hotel in this street of the Born, I would have thought ” no way”. But things are changing, the neighborhood improves, and the streets around are changing, too. This hotel, in a side street off the beaten path of the tourists, will allow you to experience the real and multicultural Barcelona. Get a loft room and feel like a local! If you’re looking for a central location near the Born district and prefer more traditional kind of hotel, in the Hotel Catalonia Born you will find a nice urban four-star hotel offering you free Wi-Fi, and rooftop swimming pool and even a spa. The decoration of the rooms might not be specially charming, but it has everything you’re looking for in a hotel. From all the El Born hotels, this is the one with the best views, as it overlooks the greenery of the Ciutadella Park, great place for morning jogs. Its decoration has a quite businesslike style, but the cool rooftop terrace with a pool and views over the park makes up for it. Despite all the hotels in El Born district have great shopping nearby, this hotel is actually located in one of my favorite shopping streets in the district: Argenteria (attention: it is a pedestrian area and sometimes taxis can’t drop you at the door). In the same building you also have a wonderful Catalan restaurant: Senyor Parellada. A hotel in a good location in the edge of El Born district, designed in a urban modern style with no frills. It features a great rooftop terrace with pool, and an Asian-Mediterranean fusion cuisine restaurant. Our bonus content in our list of hotels in El Born district of Barcelona is located in the east side of El Born, right in front Espai Sucre: a restaurant where all the dishes are sweet. Informal but cool at the same time, from all El Born hotels, this is one really captures the personality of the district. The decoration is surprising: you will be able to change the color of your room to match your mood! Now is your turn to tell us your opinion. Which one of these hotels in El Born district goes best best with your personality? Great advice on hotels for El born. Difficult area to search.